How can a gift last a lifetime? When it’s the gift of a StoryCorps conversation, recorded and uploaded via the free StoryCorps App. 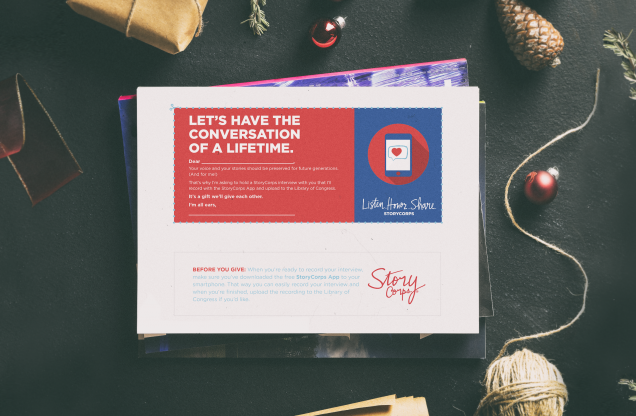 It’s never been simpler — or more gift-able — to pledge to honor a loved one by recording their voice and preserving it along with the hundreds of thousands of conversations StoryCorps has contributed to the Library of Congress. Here’s your one-stop gift guide for an experience you, your loved one, and future generations will cherish. Download and print your StoryCorps interview coupon here. (Pro tip: A color printer will give you the best result; printing on heavier-stock paper, even better, though regular paper works, too.) Write in the name of your loved one, sign it, and trim it along the dotted lines. It’s the perfect size for slipping into a stocking or a greeting card, affixing to a wrapped gift, or just delivering in person. What are you giving when you promise to interview someone the StoryCorps way? It means you want to show someone special that their voice and their story matters. That they mean so much to you that you want to set aside 30–40 minutes to ask them questions about their life and their outlook, and then really listen while they answer. The StoryCorps App will guide you through the process. At the end of the interview, you’ll have a recording you can revisit again and again — and that you can upload to the StoryCorps Archive so that a copy is also housed in the Library of Congress, where we’re always adding to the largest single collection of human voices in the world. There are no right or wrong questions or answers — and the StoryCorps App suggests some of our Great Questions, devised through years of guiding people through recording interviews about life, love, loss, and other moments and milestones that shape our lives. When you’re ready to conduct the gift of an interview, just find a comfortable, quiet place; let your curiosity be your guide; and keep in mind one of our favorite StoryCorps expressions: Listening is an act of love.